Kitware releases new binaries and source code. A screenshot exemplifies results from CMake in a dashboard. The release increased support for common programming languages to allow more projects to engage CMake as their build system. Kitware released version 3.8 of CMake, an open-source solution that builds, tests and packages software. The release increased support for common programming languages to allow more projects to engage CMake as their build system. In particular, CMake gained first-class support for CUDA and CSharp (C#). The support allows developers to capture all of the features of CMake, when they build projects with these languages. Another new development made it easier to build projects through functionality that helps to compile targets. The functionality uses meta-features to automatically determine the appropriate compiler modes for given clients. In addition, CMake gained recognition for more standards of C++ and other languages, including C++11, C++14 and C++17. To read more release notes on CMake 3.8 and to stay up-to-date on CMake development, please go to the Kitware blog. To download the software, please visit the CMake download page. 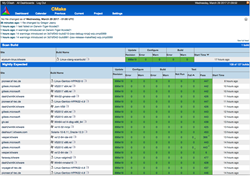 Version 3.8 served as the first major CMake release in 2017. Development on the open-source solution dates back to August 2000. Today, projects around the world rely on CMake such as the Visualization Toolkit (VTK) and ParaView. To learn how to benefit from these and other solutions that Kitware develops, please contact kitware(at)kitware(dot)com.